Operation is simple. 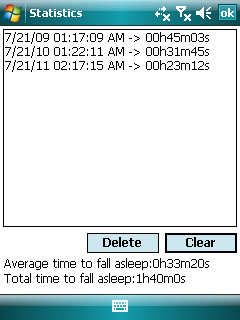 Calculated as the time to fall asleep while you hold the screen. Hands away from the screen will move freely asleep? Statistics screen, you know that was from when to when to hold the screen. In addition, they also show the average or total. For your sleeping comfort. If you donated, international money order is good.
. Net Compact Framework 3.5 Windows Mobile 5, 6, 6.5 (must have touch screen) QVGA screen size required.